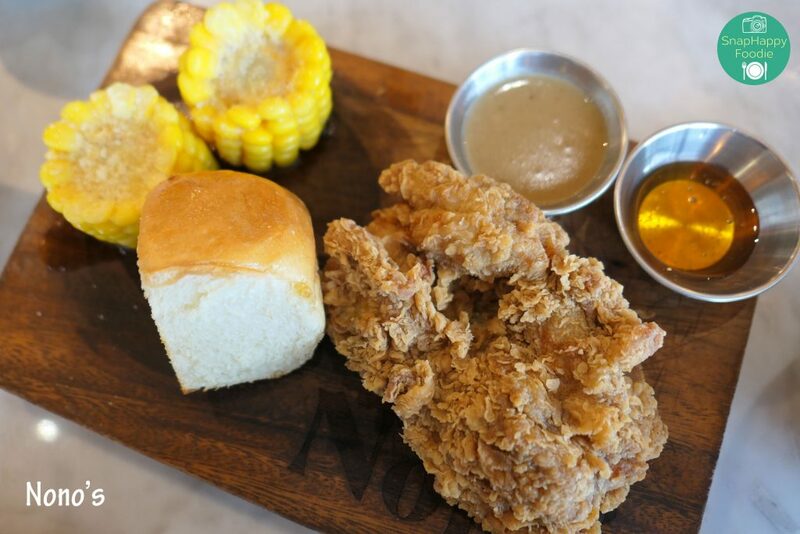 Nono’s, as per their tagline, serves “Comfort Food Done Right” in a casual dining environment. With six branches in the Philippines, you can choose the branch closest to you. For me, I go to their U.P. Town Center because it is the closest branch to our place. I’ve been meeting up with friends there, but I’m sharing with you, my dear readers, the pictures of food from my first visit that enticed me to keep going back to Nono’s. 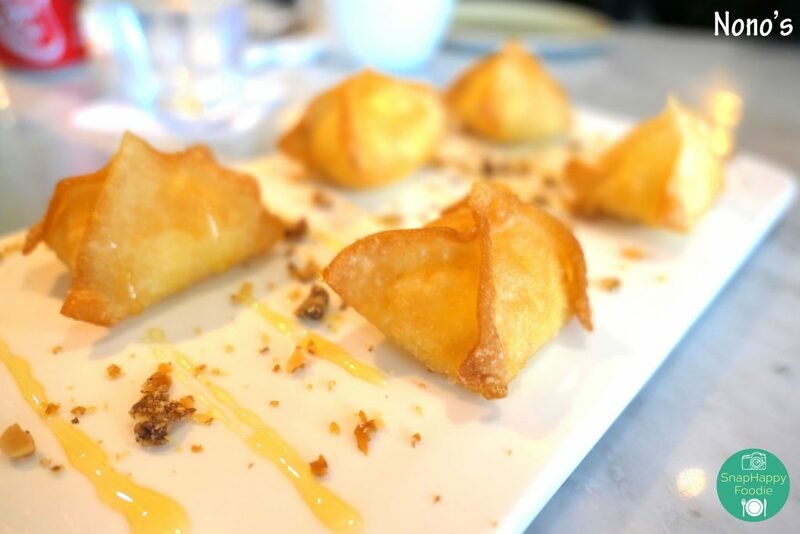 Let’s start with these Fried Truffle Cheese Wontons. These are wontons stuffed with mozzarella and cheddar cheeses, then drizzled with honey and truffle oil. I risked my lactose-intolerance side effects of bloat and gas by eating these. Worth it! The next thing we ordered was their signature Nono’s Homestyle Fried Chicken. 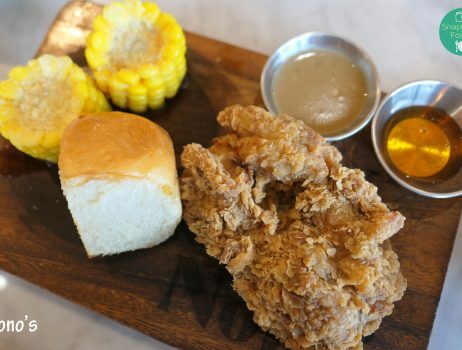 You get two pieces of crispy boneless chicken fillet with country style gravy and honey. It comes with a dinner roll, corn on the cob, and a choice of fries or rice. I chose rice (not in the picture). What’s more, the fried chicken was not greasy! FYI: if your fried food is greasy, it usually means the oil used to fry it was not hot enough. Food fried in perfect temperature will be deliciously crisp-on-the-outside. To continue. . . This Crispy Pork Belly was truly crispy. You might be saying, “well duh! 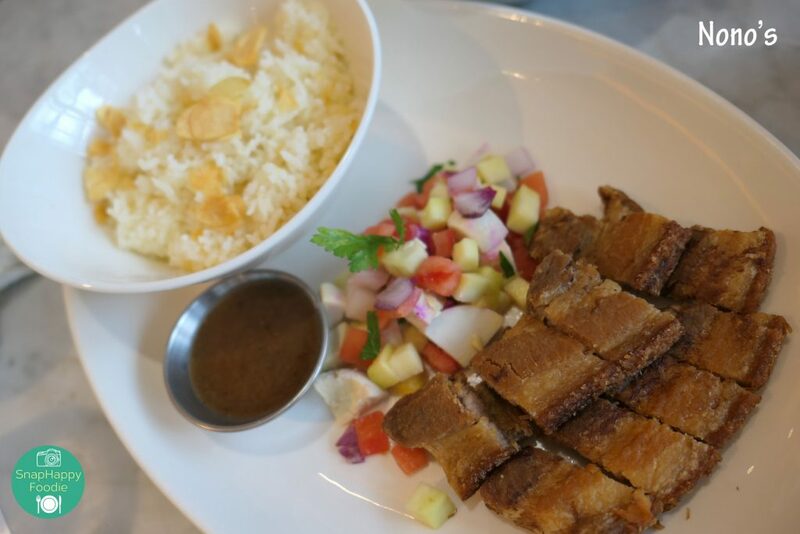 It is called Crispy Pork Belly!” But trust me, I’ve been to restaurants that describe a menu item as crispy and it’s so far from that – more along the lines of chewy and rubbery. 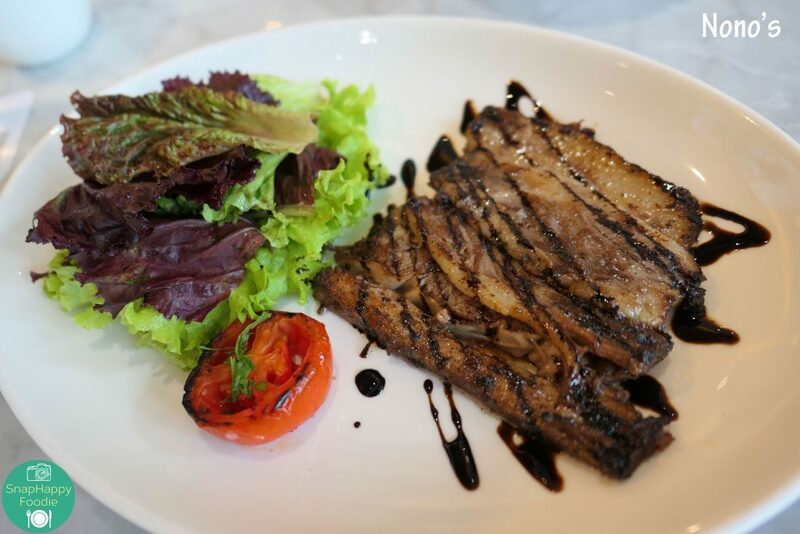 But not this pork belly from Nono’s! It came with liver sauce and mango, tomato and salted egg salsa, plus garlic rice. Perhaps they added a little bit of salsa to offset whatever sin you commit by eating pork belly…ho ho. Last but not the least, this Roasted Beef Belly that had “three slices of slow-roasted USDA beef belly, drizzled with balsamic glaze, served with horseradish cream and mashed potatoes”. Tender beef, although I think the balsamic glaze could be a little lesser. But that’s just me. Verdict: I like Nono’s. It’s the place I suggest when I meet up with friends. They serve good food family-style in a quiet and relaxed ambiance – perfect for catching up with friends. You go there to eat, and no one’s rushing you to eat quickly. I’ve been here three times already, and the service remains consistent. The serving staff is attentive without being overbearing, friendly without feeling too familiar. G/F, Three Central, Valero St.